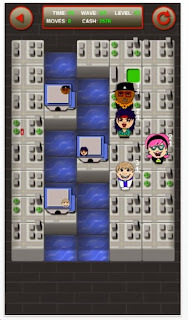 Joseph Carlson recently contacted me about his new puzzle app game MegaStars. Looking at the images, I was a bit skeptical! The images remind me of South Park. The object is to get each DJ to the correct disco. I did the first 7 or 8 levels pretty quickly. Then it got tough. #9 is very challenging. (There are 64 levels.) Do you remember my blog entry about Vubu? It's a little like that. A DJ can travel along the city blocks only if another DJ is adjacent to him. This gets very interesting, puzzle-wise. It's like a group of people who walk while holding hands, but everybody must go their separate ways. The graphics are a bit clunky. I really like the fact that, from an aerial view, you can see the cars driving down the blocks. Reminds me of Grand Theft Auto 2, back in the day. Zombies pop up and must be killed off before they start singing Karaoke. Each DJ has a traveling power, which indicates how many blocks they can travel. Each DJ has his own power; one can jump over water. Do me a favor, check out the video, it's 1 minute long. I should note: MegaStars is free. MegaStars is a serious challenging puzzle app. Please give it a try for 20 minutes and let me know what you think. Heads-Up: This blog will announce the Best Puzzle App Games of 2013 on December 30 and December 31. Update: check out this walkthrough. Hello, I want you to get to know my campaign, I’m looking for donors or sponsors to finish 3 games that I am working on right now and also in future I would like to manage my own company focused in games and APPs. This project is really important for me and my family, it’s a dream that I would like to make come true and for which I have fought at the point of being exhausted. Sometimes small contributions could make a project to become great and successful.